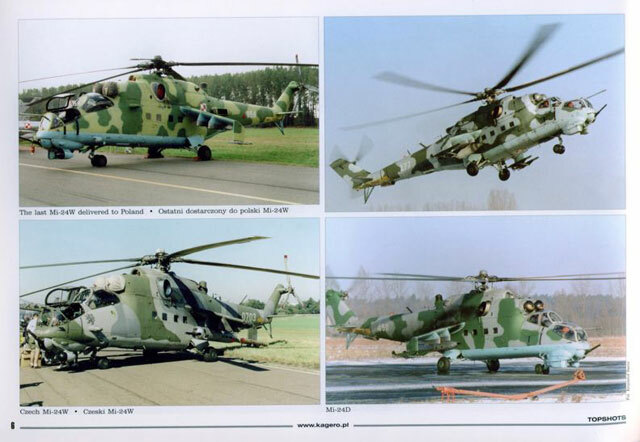 Advantages: Great photographic reference for the Hind. 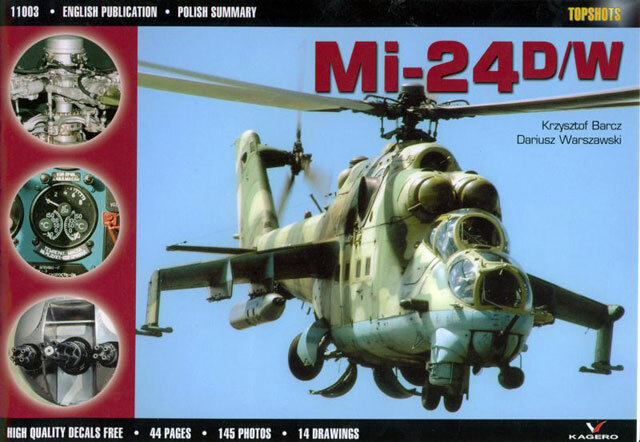 Topshots Mi-24D/W is the third in a series of new publications from Polish Publishers Kagero. Having introduced this style of publication to their line with 11001 MiG-21MF, again this volume is a photographic walk around book covering the Hind D and W in Polish Service. As with their earlier work, the authors Krzysztof Barcz and Dariusz Warszawaski, have compiled a detailed reference of the type. This time we are treated to 145 full colour photos complemented by 14 drawings, including a beautiful set of colour drawings of the pilots and gunners cockpits of both types. If a modeller was planning to build a say the Trumpeter 1/48 or 1/35 Hinds, or the Monogram 1/48 and Hasegawa 1/72 renditions they would find this neat little A5 booklet a most valuable reference. Accompanying the book, and common with other Kagero publications, is a small decal sheet printed by Techmod. 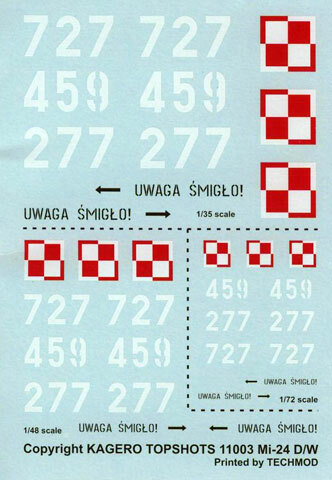 This sheet provides markings for three Hinds, W no 727 and D nos 459 and 277. 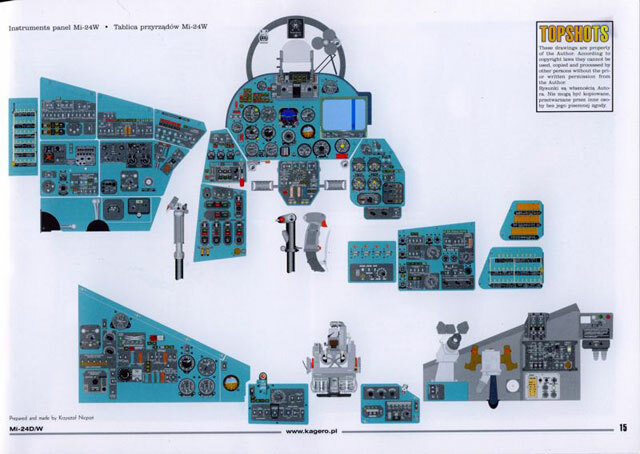 All aircraft are covered in clear photographs giving a modeller an overview of the three different schemes depicted. Unfortunately none of these three airframes feature the Squadron insignia of the 1st or 2nd Squadrons of the 49th Assault Helicopter Group as they would provide some welcome colour on the forward fuselage. This sheet is well printed and in register whilst the options are provided in all 1/72, 1/48 and 1/35, scales in which models of the Hind are readily available. As was the case with the previous MiG-21 book unfortunately no diagrams or any colour matches for the illustrated scheme are provided. That said all three airframes appear to have variations on standard Soviet/Russian schemes and a source such as Linden Hill Decals would be able to provide these. All photo captions are in English with a Polish summary provided. Despite the shortcomings with the decal sheet instructions the book itself will serve modellers well. Other “Topshots” titles include MiG-21MF, TBM-3 Avenger, and Bf-109G-6.